Feelings: $7 pudding, anyone? Enter Puddin'- the newly opened pudding shop in East Village, created by Ms. Clio Goodman. Although they do serve non-pudding delights like brownies, cookies and cakes as well as Stumptown coffee and Harney and Sons tea, expect this spot to be completely devoted to the pudding. After our Japadog outing, we walked a couple blocks down on St. Marks for some serious pudding action. The store is cramped just like the other small bakeries in the area. When 11 of us stormed in, we had no room to breath, but we had a plenty of room for smooth pudding. 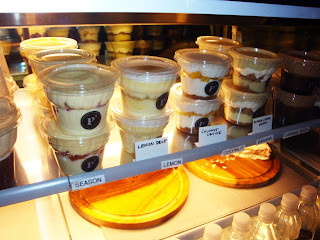 Puddings are $5.50 for eight ounces, $1 toppings, and parfaits at a steep price of $6.50 for small and $9.25 for medium. "Yay overpriced pudding!" said JBH with much enthusiasm. "Still in love with my banana parfait (with real banana pudding, graham cracker crumbs, fresh banana cake, dollop of whip cream)." BLee's Lemon Drop Parfait (lemon pudding, crushed ginger crunch cookies, toasted marshmallow creme) was rather disappointing and visually unappealing. "It did not taste lemony enough, and the overall texture was thin and runny, even the marshmallow creme topping, " said BLee. No one wants $7 runny pudding. Meanwhile, JT enjoyed the layer of rich dark chocolate at the bottom of his caramel macchiato parfait (coffee and chocolate pudding, brownie pieces, salted caramel sauce). He said, "RB looked to have made the best decision in getting a customized single pudding flavor - Chocolate pudding with brownie chunks and chocolate chips." Effie felt the pudding was good and rich but overpriced. "You would see in a fancy restaurant for pudding. This was served out of a plastic cup, so $7 is a bit hard to justify!" The service is friendly, and it is a cozy, cute, and delightfully smelling space. They are completely vegetarian, and their coconut flavor is 100% vegan. When you take a deep breath, the almost overwhelming, intoxicating aroma of melting Icelandic chocolate will take you away to the pudding land. If you are feeling nostalgic about your Jello days, Puddin' will satisfy your craving in a clean, gourmet way. I did not grow up here, and my first reaction to Jello pudding was "some sort of grotesque paint supply." Therefore, it is hard for me to review the pudding, but it was luscious and tasty nonetheless. 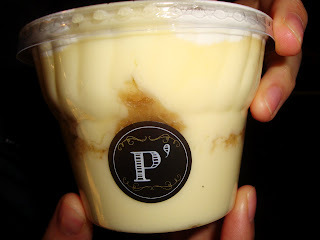 My recommendation here is to get the creamy chocolate or banana pudding with crunchy toppings to contrast the texture. I do have a hankering for some puddin' now from just looking at those photos again. Great time, Yoshie! I had a great time! !